"Zem Media brings innovative new ATM Digital Topper solution to market that works with every make & model of ATM." Zem Media, the digital signage solution provider who brought one of the most economical and user friendly content management systems to the digital signage world, has announced today the availability of Zem Mount, a universal mounting system designed to quickly, easily, and economically bring digital signage to the world of ATMs by making it simple to add Digital Toppers to existing or new ATM installations. The Digital Topper solution is designed to bring the dynamic world of cloud-based digital signage to the ATM in a simple manner. 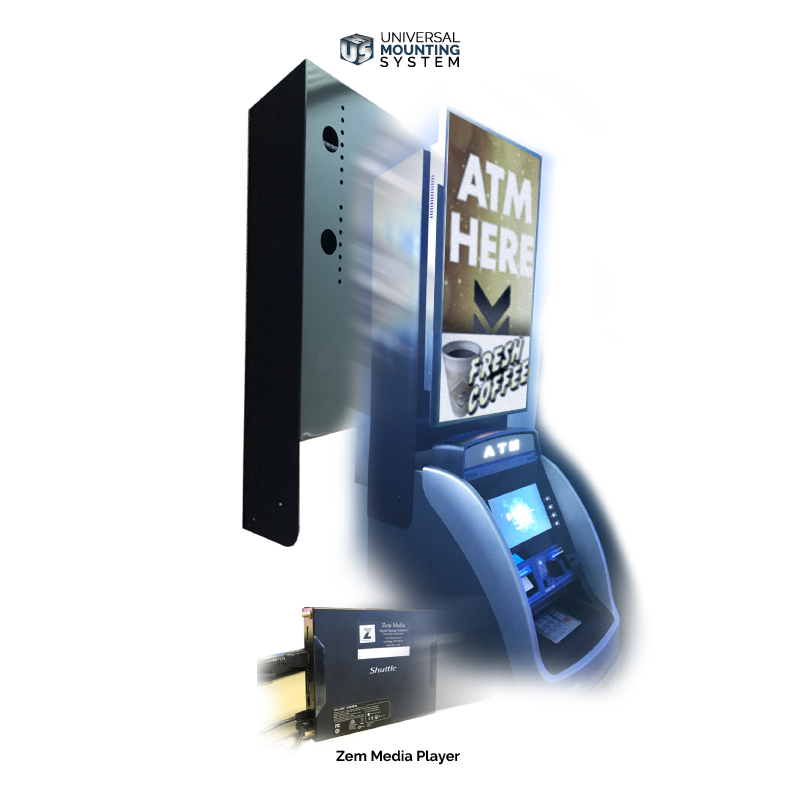 The ATM deployer can now take advantage of the “real estate” above the ATM in a meaningful way along with giving them the opportunity to monetize that space. The solution includes a 32” commercial grade HD LED Monitor and the Zem Media Player enclosed in a protective steel casing which presents a clean, professional appearance. The Universal Mounting System® allows for a seamless installation experience on any make or model of ATM. The content is managed using Zem Media’s easy to use Content Management System. The deployer can develop and use their own content, typically specifically purposed for the ATM location, or Zem Media’s Content Creation Team can assist. Zem Media is the Digital Marketing Solutions Division of JB Carter Enterprises, a 20 year old privately held company headquartered in Las Vegas, Nevada, which also includes ATM Merchants Systems and Multi-Choice Cash. Zem Media provides Digital Signage Solutions for all industry verticals and with the most dynamic, user friendly, scalable Content Management solution available today, gives customers the tools to get started with digital signage or to optimize their existing signage network. Zem Media’s Professional Services Content Creation Department gives a company everything it needs to quickly and effectively take control over it’s digital marketing. Zem Media is your End-to-End Digital Signage Solution Provider.